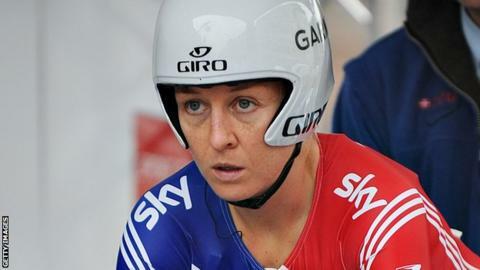 Norfolk's Emma Pooley could quit cycling after next week's World Championships in the Netherlands. The Great Britain rider, 29, whose Dutch team are leaving the sport, divides her time between racing and completing a university doctorate. "I might take a year off or I might stop, I haven't really decided yet," she told BBC Radio Norfolk. Pooley won the world time trial title two years ago and was a silver medallist at the 2008 Beijing Olympics. However, her hopes of another Olympic medal at this summer's London Games ended in disappointment when she finished sixth in the time trial behind Kristin Armstrong of the United States. She will be unable to do much training this winter as she completes work on her PhD in geo-technical engineering at ETH Zurich university in Switzerland. "I don't want to race and race really badly, so it depends if I could find a time that would let me work around my PhD commitments, which I probably could, but I'm just not sure how I feel about it at the moment. "I'm going to wait and see. At the end of the season, after the World Championships, it'll be a bit clearer in my head and I'll be able to make a decision," she said. Pooley's situation has been complicated by news that her AA Drink-Leontien.nl team are folding because of budgetary problems. She continued: "It's not that easy in the women's cycling scene because there aren't enough teams. "Every year a team or two seems to go under, so every year there are always lots of good riders looking for places. I think I could find a team, I've talked to a few." Pooley began cycling at 11 and first rode competitively in 2005. Her first road race victory came two years later. Then, in 2008, she took silver behind Armstrong in Beijing after covering a hilly 23.5km time-trial course in 35 minutes 16.0 seconds. She clocked 32:48.44 to capture the world time-trial title in Australia in 2010 but had to settle for bronze behind Germany's Judith Arndt at last year's World Championships in Denmark. Pooley has been a leading voice in urging the International Cycling Union (UCI) to raise the profile of women's racing and is also concerned about the inequality in prize money between the sexes. "If I was a male cyclist, I wouldn't have to work after I finish cycling," she said. "It's a bit like football. The wages are much higher, not at all levels, but, at the level I've got to in women's cycling, the disparity in pay is quite incredible." But she added: "I'm not suggesting I should be paid millions. I'd like to have a useful, productive job when I've finished cycling."